Murphys, CA...Planning to attend one of our upcoming concerts or events? Contact Murphys Taxi Service, to arrange for a ride both ways! Call (209) 795-7777 for all the details. Planning to spend a Saturday in Murphys, try out the new Saturday Hopper bus service running between Valley Springs and Murphys with stops in between. Thursdays at the Murphys Hotel - Karaoke in the Saloon from 8:30 to Midnight. Third Thursdays at the Murphys Historic Hotel - Classic Car Show Every 3rd Thursday @ 5p with Live D.J., Cash Raffle, and BBQ Food! Fridays and Saturdays at Zucca Tasting Room - "Zucca After Hours" is open 5-8 pm. If you're looking for a cozy spot to enjoy a glass of wine on a Friday or Saturday night, the Zucca garden is your place. We always welcome your picnic items or takeout from area restaurants. 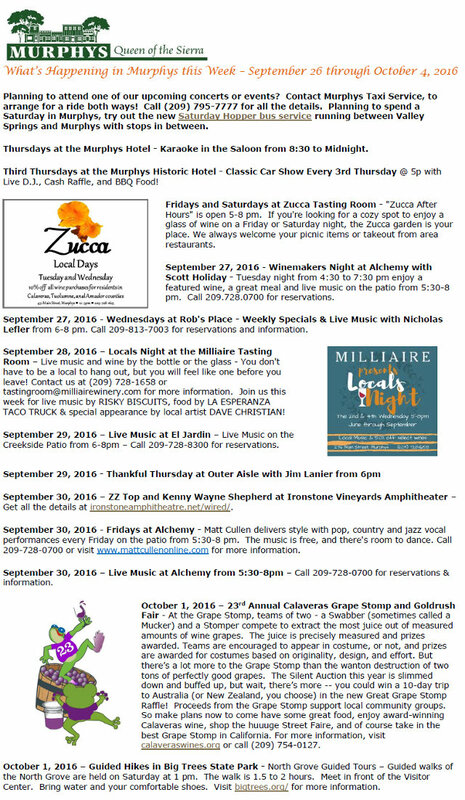 September 27, 2016 - Winemakers Night at Alchemy with Scott Holiday - Tuesday night from 4:30 to 7:30 pm enjoy a featured wine, a great meal and live music on the patio from 5:30-8 pm. Call 209.728.0700 for reservations. September 27, 2016 - Wednesdays at Rob's Place - Weekly Specials & Live Music with Nicholas Lefler from 6-8 pm. Call 209-813-7003 for reservations and information. September 28, 2016 – Locals Night at the Milliaire Tasting Room – Live music and wine by the bottle or the glass - You don't have to be a local to hang out, but you will feel like one before you leave! Contact us at (209) 728-1658 or tastingroom@milliairewinery.com for more information. Join us this week for live music by RISKY BISCUITS, food by LA ESPERANZA TACO TRUCK & special appearance by local artist DAVE CHRISTIAN! September 29, 2016 – Live Music at El Jardin – Live Music on the Creekside Patio from 6-8pm – Call 209-728-8300 for reservations. September 30, 2016 – ZZ Top and Kenny Wayne Shepherd at Ironstone Vineyards Amphitheater – Get all the details at ironstoneamphitheatre.net/wired/. September 30, 2016 - Fridays at Alchemy - Matt Cullen delivers style with pop, country and jazz vocal performances every Friday on the patio from 5:30-8 pm. The music is free, and there's room to dance. Call 209-728-0700 or visit www.mattcullenonline.com for more information. September 30, 2016 – Live Music at Alchemy from 5:30-8pm – Call 209-728-0700 for reservations & information. October 1, 2016 – 23rd Annual Calaveras Grape Stomp and Goldrush Fair - At the Grape Stomp, teams of two - a Swabber (sometimes called a Mucker) and a Stomper compete to extract the most juice out of measured amounts of wine grapes. The juice is precisely measured and prizes awarded. Teams are encouraged to appear in costume, or not, and prizes are awarded for costumes based on originality, design, and effort. But there’s a lot more to the Grape Stomp than the wanton destruction of two tons of perfectly good grapes. The Silent Auction this year is slimmed down and buffed up, but wait, there’s more -- you could win a 10-day trip to Australia (or New Zealand, you choose) in the new Great Grape Stomp Raffle! Proceeds from the Grape Stomp support local community groups. So make plans now to come have some great food, enjoy award-winning Calaveras wine, shop the huuuge Street Faire, and of course take in the best Grape Stomp in California. For more information, visit calaveraswines.org or call (209) 754-0127. October 1, 2016 – Guided Hikes in Big Trees State Park - North Grove Guided Tours – Guided walks of the North Grove are held on Saturday at 1 pm. The walk is 1.5 to 2 hours. Meet in front of the Visitor Center. Bring water and your comfortable shoes. Visit bigtrees.org/ for more information. Visit MurphysLiveMusic on Facebook for more events from Copperopolis to Bear Valley.